Non-enveloped, head-tail structure. The icosahedral head is about 55 nm in diameter. The major capsid subunit proteins are cross-linked creating oligomers. The non-contractile tail is about 113 nm in length and 7 nm in width, possessing six tail fibers with terminal knobs. Linear, dsDNA genome of about 98 kb, encoding about 98 proteins. 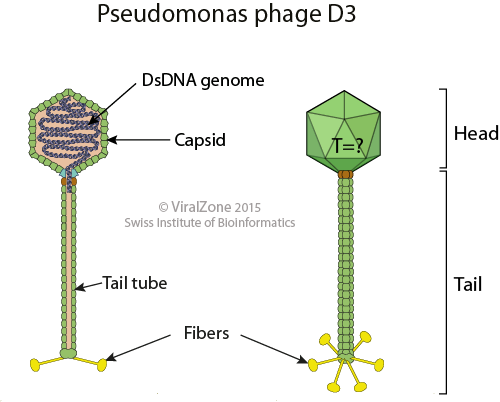 Displays 3' cohesive ends (Pseudomonas phage D3).